If you want to get mice out of your house, but you don't necessarily want them dead, this easy-to-assemble (and kinder) mousetrap may be just what you need. Here's how to make it. None of us loves the idea of little Mickeys and Minnies scurrying around our homes. Some people insist they’re cute, and maybe they are, but the fact is that mice carry dangerous diseases and are capable of causing considerable damage. Fortunately, options exist beyond the cruel contraptions you may have seen in the past. Here’s a homemade mousetrap you can easily make out of items you probably already have on hand. And the best part is that it works without doing any harm. This apparatus is called a bucket trap. You spread peanut butter on an empty can, which is then suspended by metal wire over an open bucket. When the mouse ventures onto the can in pursuit of the bait, the can starts to spin. The mouse consequently loses its balance and falls into the bucket, from which it cannot escape. Don’t worry; the drop is not likely to injure the mouse. By the time you arrive to set it free, the mouse may in fact still be enjoying the peanut butter! Using a soup can? Carefully remove the lid (if it’s still attached) and drill a hole into the opposite end. With a soda can, you should be able to poke a hole in the bottom with a Phillips-head screwdriver. For your trap to be successful, the bucket must be large enough to contain the mouse once it’s been caught. At minimum, choose a five-gallon bucket. Ideally, its interior surface should be smooth and free of any scratches that could help the critter climb out. To ensure the desired results, consider lining the bucket with a layer of oil or grease. An inch or so below the rim of the bucket, drill two holes, one directly across from the other. 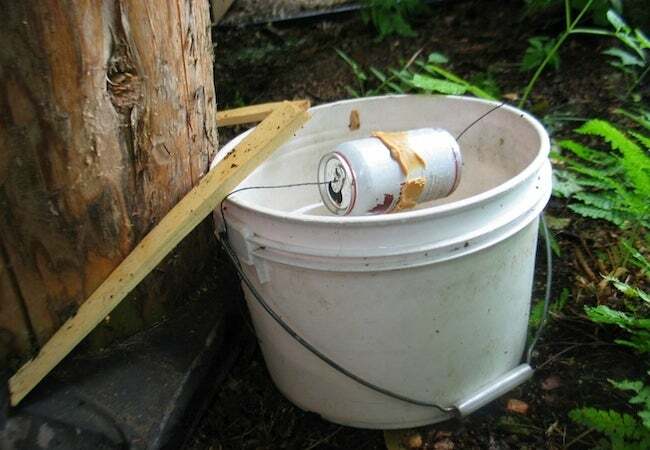 Feed thin steel wire (or a repurposed clothes hanger) through the can, hooking the wire through the drilled bucket holes. Move the can along the wire so that it’s right in the middle of the bucket. At this point, make sure that the can is able to spin easily, or else you’ll have a tightrope-walking mouse with peanut butter breath running around the place. Don’t give mice any reason to think twice about going after the peanut butter. Among your scrap wood, look for a beam or plank that, when angled against the bucket, will create a low, welcoming incline and a short distance to the top. Finally, spread a generous amount of peanut butter over the can. Then wait. If you’re trying to catch mice in a trafficked area like the kitchen, leave your trap overnight and check back in the morning. For areas like the garage, check back every few hours. It won’t be long before you’ve captured a critter—or even several. 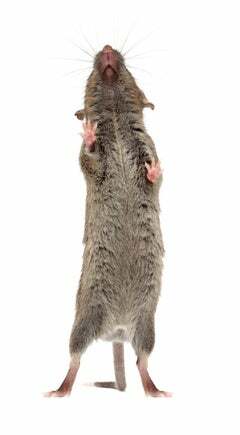 When it’s time to set the mice free, go to a location sufficiently removed from where you live. Otherwise, the mice are destined to return sooner rather than later. Happy (humane) hunting!